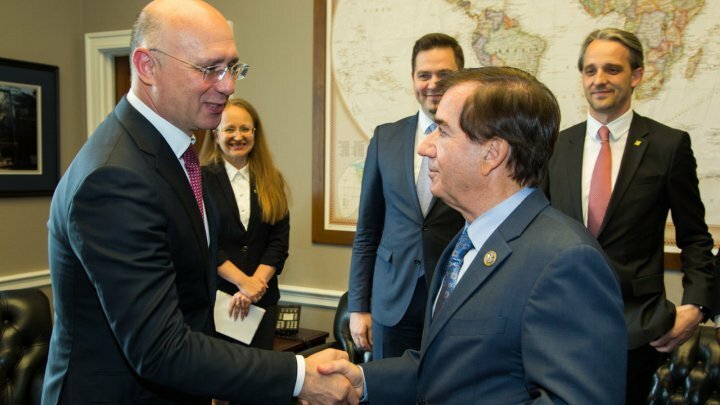 During the visit to Washington, Prime Minister Pavel Filip, has met with member of the United States House of Representatives, Edward Royce. During the talks, Prime Minister reconfirmed the Republic of Moldova's commitment to continue the strategic partnership between Moldovan and the USA, including on the dimension of interparliamentary diplomacy. The two officials have exchanged opinions on the situation around the Republic of Moldova and evaluated options for bilateral cooperation to ensure regional stability and security. Prime Minister appreciated the importance of the Resolution included on the agenda of the House of Representatives, where the United States Congress supports the Republic of Moldova, Ukraine and Georgia in their efforts to ensure territorial integrity and political sovereignty. Parties spoke of the relations between Moldova and Russia and the fight against Russian propaganda in Moldova. Reforms unfolded in the Republic of Moldova were also discussed. The US official encouraged authorities from Chisinau to continue implementing the reforms, to fortify the Republic of Moldova's development after the western model, including in combating corruption and respecting the rule of law. Edward Royce also expressed his openness for a more dynamic relation between the companies from the USA and Moldova, insisting on the importance of ensuring an efficient legal framework favoring investments and to diversify bilateral economic relations.